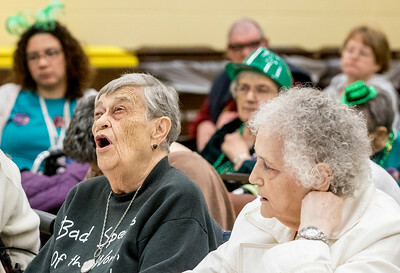 Sarah Nader- snader@shawmedia.com Alden Gardens of Bloomingdale resident, Jane Ragland (left) and her teammate Donna Tanner discuss their answer while competing in the Brain Game north central regional trivia tournament in Huntley Wednesday, April 22, 2015. Nine area supportive living centers competed in the contest which was held to raise awareness for supportive living week. The top two teams will go to the state meet in Springfield at the end of May. 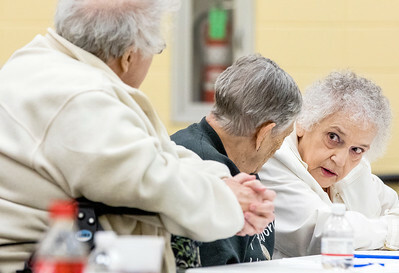 Sarah Nader- snader@shawmedia.com Alden Gardens of Bloomingdale resident, Donna Tanner (right) talks with her teammates while competing in the Brain Game north central regional trivia tournament in Huntley Wednesday, April 22, 2015. Nine area supportive living centers competed in the contest which was held to raise awareness for supportive living week. The top two teams will go to the state meet in Springfield at the end of May. Sarah Nader- snader@shawmedia.com Victory Centre of Vernon Hills residents, Irwin Liberman (left) and Mike Stock discuss their answer while competing in the Brain Game north central regional trivia tournament in Huntley Wednesday, April 22, 2015. Nine area supportive living centers competed in the contest which was held to raise awareness for supportive living week. The top two teams will go to the state meet in Springfield at the end of May. 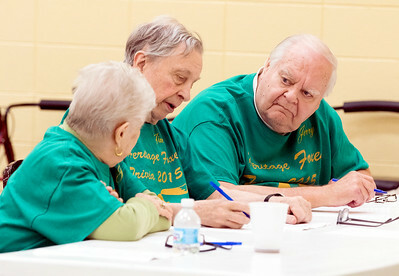 Sarah Nader- snader@shawmedia.com Heritage Woods of Batavia residents, Mary Jane Hillier (left), James Gent and Jerry Wall discuss their answer while competing in the Brain Game north central regional trivia tournament in Huntley Wednesday, April 22, 2015. Nine area supportive living centers competed in the contest which was held to raise awareness for supportive living week. The top two teams will go to the state meet in Springfield at the end of May. 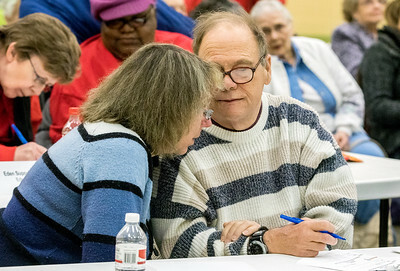 Sarah Nader- snader@shawmedia.com Deer Path of Huntley residents, JoMarie Listinsky (left) and Gary Niesel discuss their answer while competing in the Brain Game north central regional trivia tournament in Huntley Wednesday, April 22, 2015. Nine area supportive living centers competed in the contest which was held to raise awareness for supportive living week. The top two teams will go to the state meet in Springfield at the end of May. 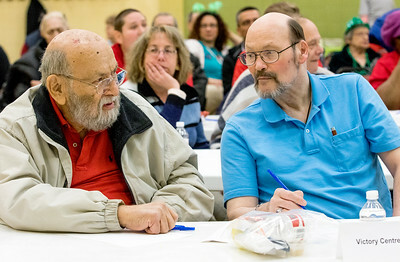 Victory Centre of Vernon Hills residents, Irwin Liberman (left) and Mike Stock discuss their answer while competing in the Brain Game north central regional trivia tournament in Huntley Wednesday, April 22, 2015. Nine area supportive living centers competed in the contest which was held to raise awareness for supportive living week. The top two teams will go to the state meet in Springfield at the end of May.